I found this image a couple of weeks ago when I surfed over to the Wikipedia entry on the small city in Central IL that I lived in from June 10th, 1977 'til June 9th, 1985. The first non-kid's movie I remember seeing was at the Fischer Theater (c. 1884), pictured on the right. Star Wars as a six year old in the summer of 1977 was mind-blowing. A few doors south of the Fischer one can faintly see a SEARS sign, the store that my dad was the Merchandise Manager of for seven years. The drugstore across the street from the Fischer (surprisingly not a Walgreens) was Alexander's when I lived there. The last of a now-extinct breed - a family owned sporting goods store. 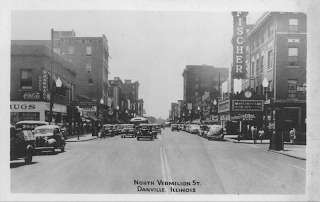 I don't miss Danville one bit but I do have some very fond memories of growing up in that small city.